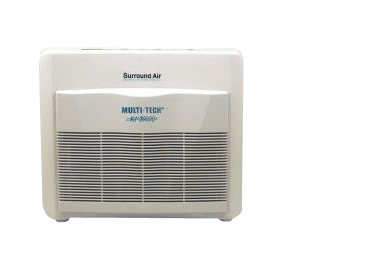 The Surround Air Multi-Tech XJ-3000C Air Purifier is the ultimate in convenience and effectiveness. Uses a true HEPA filter to capture dust and allergens, a germicidal UV lamp to eliminate micro-organisms, activated carbon for smoke and odors, and an ionizer for particles and bacteria. Quiet operation, low energy usage, low replacement costs, and covers up to 500 sqft! FREE SHIPPING DIRECTLY FROM MANUFACTURER! †Results may vary. What are the Benefits of the Multi-Tech XJ-3000C? Outperforms the Ionic Breeze in clinical tests and is less than half the price. Offers better dust removal and germicidal capability, at less than half the cost of the Oreck XL. Performed comparably to the top-rated Friedrich C-90A, yet costs $300 less. Come with a 3 year warranty against manufacturing defects (does not cover filter or UV lights). The U.S. Government Recognizes Technologies in the Multi-Tech XJ-3000C as beneficial! U.S. Centers of Disease Control (CDC) recommends air purifier with both HEPA Filter and UV Light. The CDC also recommends UV lights in homeless shelters to prevent the spread of disease, particularly TB (tuberculosis). Dept. of Homeland Security recommends HEPA air filters, along with a pre-filter to preserve the life of the HEPA filter. The U.S. Dept. of Agriculture found negative ions (ionizers) to be highly effective against dust and bacteria in recent studies. True HEPA Filter for the most effective protection against dust & allergens, such as pollen, ragweed, mites and mold spores. HEPA filters are recommended by the Department of Homeland Security and the U.S. Centers of Disease Control. Germicidal UV Lamp to destroy micro-organisms such as germs, viruses, bacteria and fungi (such as mold toxins). Recommended by the U.S. Centers of Disease Control and the Air Institute of Respiratory Education. Also disinfects the micro-organisms that are trapped in the HEPA filter, which is why the CDC recommends using a germicidal UV lamp and HEPA air filter together. The second UV lamp in the Multi-Tech XJ-3000C can be turned on when extra sanitization strength is needed. Ionizer which disperses negative ions to seek out and remove particles & bacteria from the air. Proven by government studies to be effective, and to enhance performance of filters. Found to be highly effective in multiple U.S. Dept. of Agriculture studies. Programmable Sanitizer to neutralize powerful odors. Can be completely turned off when not needed. Includes High, Medium and Low settings for appropriate output according to need. Anti-Bacterial Pre-Filter for larger particles, lengthening the life of the other filters. Pre-filters are recommended by the Dept. of Homeland Security. Quiet Operation ensuring peace and quiet while running, even with its powerful fan. Low Energy Usage ensuring low electricity costs, even if running the Multi-Tech continuously. Low Replacement Costs. Just $25 to $50 per year for replacement filters and UV lamps. The Multi-Tech cleared away the thick smoke in this air tight chamber in a matter of seconds. Proof that it effectively and efficiently removes even fine particles from the air. Many air purifiers are claimed to be effective, but few on the market can provide proof that they are effective. The Multi-Tech air purifier has proven to be nearly 100% effective in clinical test results. Most Effective Dust & Allergen Filter Available. True HEPA filters (recommended by the Dept. of Homeland Security) are more effective than any other type of air filter at capturing dust, pollen, ragweed, dust mites, mold spores and other allergens. Furthermore, in a Journal of Hygiene study, negative ions were found to improve efficiency of filter units. A Way to Kill Micro-Organisms. Most air purifiers do not have a way to destroy germs, viruses and other micro-organisms. A germicidal UV lamp is the most effective way to meet this requirement. UV light air purification is recommended by the U.S. Centers of Disease Control (CDC). Multi-Tech's ionizer is also effective against micro-organisms. The U.S. Dept. of Agriculture studies show that releasing high doses of negative ions into the air can effectively reduce airborn bacteria. And negative ions are completely safe. The Ability to Remove Chemicals, Fumes & Gases. HEPA-only air purifiers cannot remove these prominent household pollutants from the air. An activated carbon filter is necessary for this job. According to Penn State Dept. of Aerobiology researchers, carbon filters serve to remove odors, volatile organic compounds (VOCs) and chemicals that other filters cannot. A Way to Reduce Cigarette Smoke & other Odors. Many air purifiers also do not have an answer for most minute types of particulate, either. The Multi-Tech has multiple technologies for these miniscule pollutants and impurities, including the activated carbon filter, ionizer and programmable sanitizer. Seeks & Destroys Pollutants Across the Room. An ionizer (i.e. negative ion air purification) is particularly well-suited for neutralizing airborne pollutants that do not pass through the filter. The Multi-Tech circulates trillions of negative ions with a powerful fan to maximize this ability. The U.S. Dept. of Agriculture found negative ion air purification (ionizers) to be 99% effective at removing airborne dust & particles. The Multi-Tech air purifier has been awarded ETL certification, proving that it is safe to use in your home or office. It has also been certified in the state of California, and passes the UL-867 safety standard. Like most people, you are probably too busy to remember to clean your air purifier. Fortunately, the Multi-Tech does not require maintenance, so you can get on with your life, while still experiencing pure air. Applicable Area: Up to 300 sq. ft.
Each unit covers up to 500 sq. ft. In nature, negative ions are generated by processes such as sunlight, lightening, waves from the ocean, and from waterfalls. "Concrete Jungles" minimize the natural production of negative ions by disrupting the delicate electrical balance between the atmosphere and the earth. Multi-Tech air purifiers recreate them with electrode pins ("needlepoints") to electrically produce negative ions. This method produces a density that is many times higher than the negative ion level found at Niagara Falls, the highest natural producer of negative ions and one of the healthiest environments in the world. How the air-cleaning technologies of the Multi-Tech work concert to neutralize the broad spectrum of common household pollutants. Dirty air enters the the air inlet. High-Efficiency Filtration: Particles & pollutants are trapped by the 3-layer filter. The anti-bacterial pre-filter (blue) destroys bacteria and traps the larger particles, lengthening the life of the other filters. The activated carbon filter (dark gray) is the best type of air filter for trapping chemicals, gases, odors and cigarette smoke. The True HEPA filter (white) is the most effective type of air filter at capturing dust/allergens. Two powerful & quiet fans create strong air movement (for increased air-cleaning performance), yet do not disturb your home or office with loud noise. What are the Multi-Tech "XJ-3000C" Air Purifier Specifications? Air Ionizer/Negative Ions for allergens, bacteria, viruses, chemicals and more. HEPA Air Filter for particles including dust and mold spores. Germicidal UV Light for microbes such as viruses, germs, bacteria, and fungi. Activated Carbon Filter for chemicals, gases, cigarette smoke, and odors. Optional/Programmable Ozone for strong odors and filter sanitization. Can be turned completely off. "Off" Setting: Ozone Completely Disabled. On this setting, the Multi-Tech produces virtually no ozone at all. "Low" Setting: Intervals of 30 sec. "ON" and 3 min. "OFF"
"Medium" Setting: Intervals of 3 min. "ON" and 3 min. "OFF"
Square Footage Covered: 500 sq. ft.